9 June 2012 marked the start of 2 things, 1) the southern hemisphere international rugby season, and 2) the All Blacks 2nd reign as world cup champs. In the modern rugby era, world champs have notoriously suffered a hangover from their victory and hence have not started the following season well. The ABs have never suffered this hangover – because they hadn’t won the damn thing for so long (sorry for the soft expletive, that’s 24 years of frustration finally over)! Their first game of 2012 v Ireland was much anticipated – were they going to suffer the famous world cup hangover and in doing so hand the Irish there first ever victory over the ABs in their 107 year ding dong battles? I copped a heap of confident and jovial jibes from Irish friends in the week leading up to the first test – they were talking of breaking the 107 year drought. The Paddys were talking of “old man McCaw” and so on. I’ve always loved a good verbal battle with the Irish, mainly because it always ends in a good laugh and a beer. I was confident to the extent that I donned my AB replica jersey, put my drinking boots on and headed to an Irish pub in Surry Hills called the Porterhouse. After copping a few abusive yet good natured comments from the Paddy patrons (what else did I expect wearing an AB top that particular night in a Paddy pub!?!? 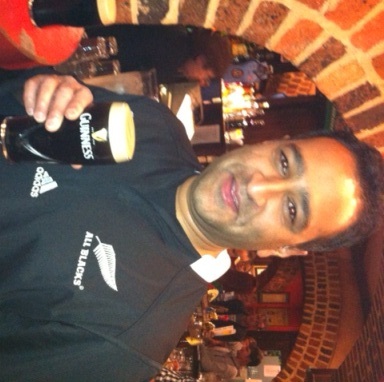 ), I settle into some top quality Guinness. The Porterhouse is one of those great old style Irish pubs that had me reminiscing about the 2001 ABs game in Dublin that I was fortunate to attend. The service from the cool, calm and collected bar staff was sensational. Not once were they frazzled despite the bar often being 5 or 6 deep. The quality of the Guinness was also a credit to this place. As it turned out the ABs had a resounding 42-10 win, the only hangover here was going to be mine from the many Guinness and the whiskey that an Englishman in our group owed me after he foolishly bet me that Ireland would win. For the second test I decided to stay in and earn a few credits at home. A visit to Dan Murphy’s at Top Ryde had me salivating at the variety of craft beers from around the globe. 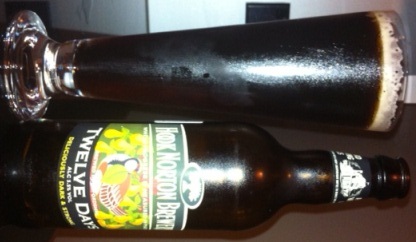 I chose Hook Norton Twelve Days from the UK which I had never heard of. The first 2 credits for this drop is that it comes in a 500ml bottle and is 5.5%. The Hook Norton Brewery has been going since 1849. Some interesting info is that their brewery, deep in the Oxfordshire country side is still powered by a steam engine. JW Clarke, the great great grandson of John Harris, the founder of Hook Norton Brewery has his autograph on the bottle. It warms the cockles of my heart knowing that this drop is steeped in tradition, history and family. On pouring it into a glass the sight of it had me thinking that it is going to be like a Guinness with its very dark appearance. Very appropriate I thought as the 2nd test was about to kick off. However, looks are deceiving. This drop was not like a Guinness. It’s loaded with the tastes of strong malts and a very nutty taste that lingers and lingers…and lingers…and then a very subtle sweet taste appears. This is a stroke of genius!! I wouldn’t say this is a sessionable beer, instead one to be appreciated in a more civilised manner. I was feeling far from civilised watching the 2nd test as the Irish almost broke their drought. The ABs stumbled their way to a last gasp 22-19 win over a very fired up and focused Irish. Full credit to BOD and his men for nearly pulling it off. A sigh of relief from all NZers as DC slotted the winning droppie in the 80th minute. For our Irish readership, it’s best not to mention the 3rd test. This correspondent has just arrived on Hamilton Island for a winter escape so will report on the beers, activities, restaurants etc and is open to recommendations from readers.